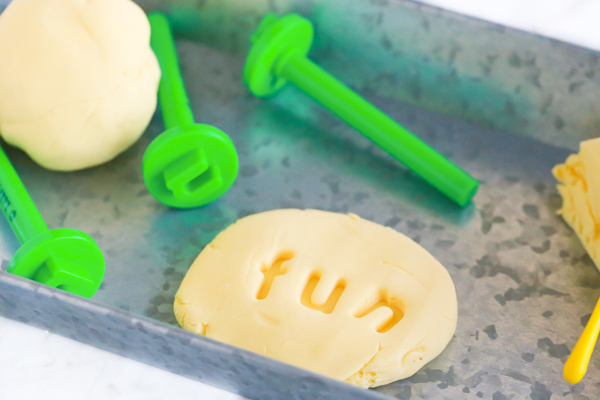 If you’re looking for a fun and easy STEM activity with your children, this Edible Jello Play Dough is a perfect choice. My kids love being in the kitchen with me making and creating. Whether we’re making something to eat or something to play with, it’s always a time of bonding and making memories. 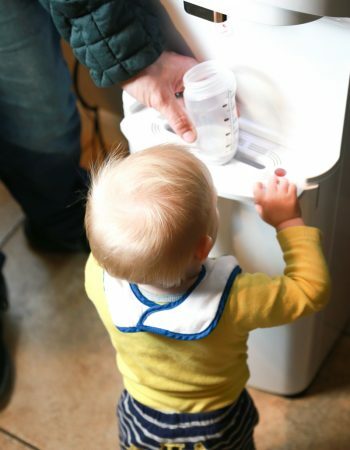 Having your children in the kitchen with you not only teaches them their way around the kitchen, but it gives them confidence and life skills that will help them later on in life. Jello play dough is exactly what it sounds like. It’s a play dough made with Jello mix. 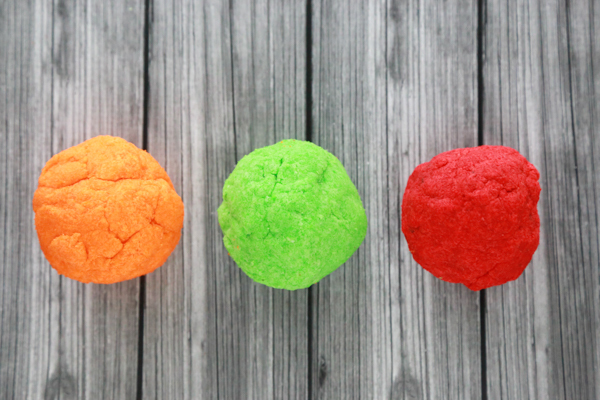 There are a couple other ingredients in this Jello play dough recipe, but really, it’s so easy to make and the kids will love it. 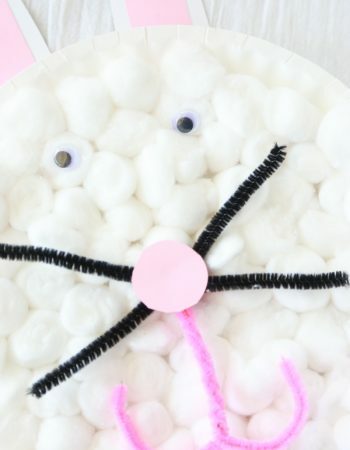 This particular recipe is a no cook Jello play dough recipe which makes it safe for little hands to help. And if they happen to put their little hands in their mouths, it’s totally safe. 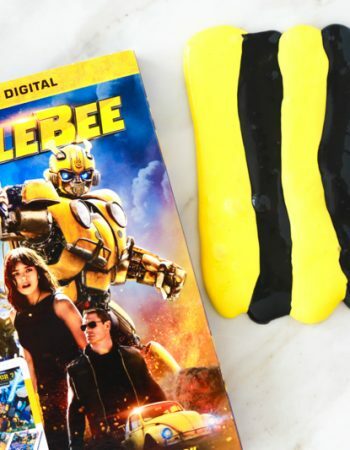 As a mom too I know that making things we find on the internet doesn’t always work out the way it’s supposed to. 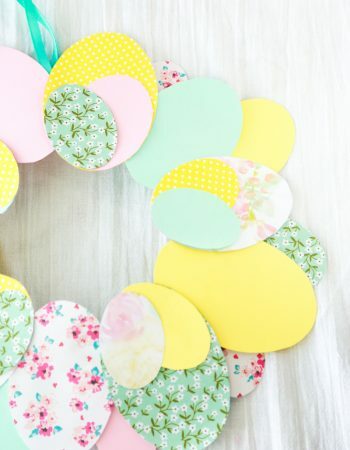 But with this super simple Jello play dough, I don’t really think you can go wrong. 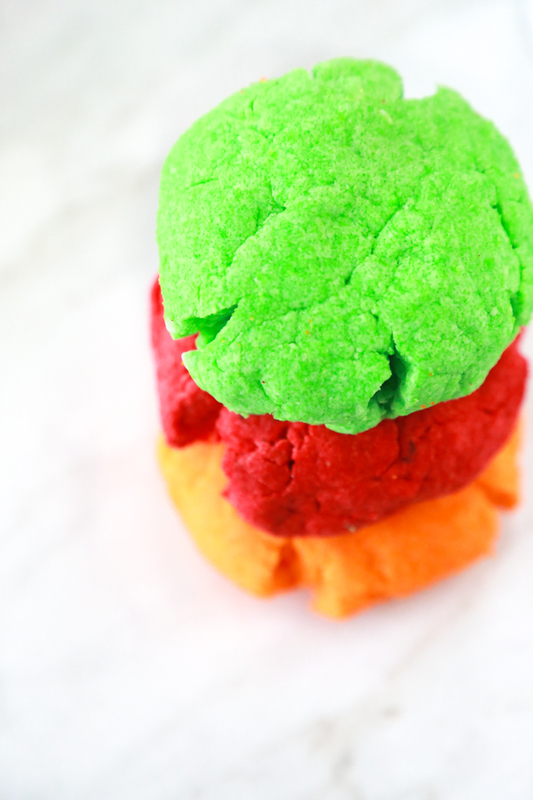 When I say this Edible Jello Play Dough recipe is easy to make, it really is easy to make! 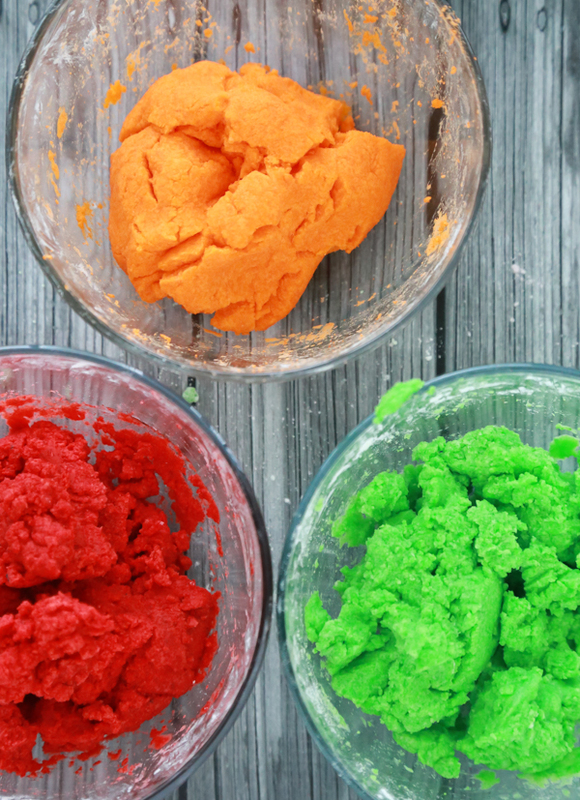 You’ll only need three common kitchen ingredients to make this edible play dough recipe. 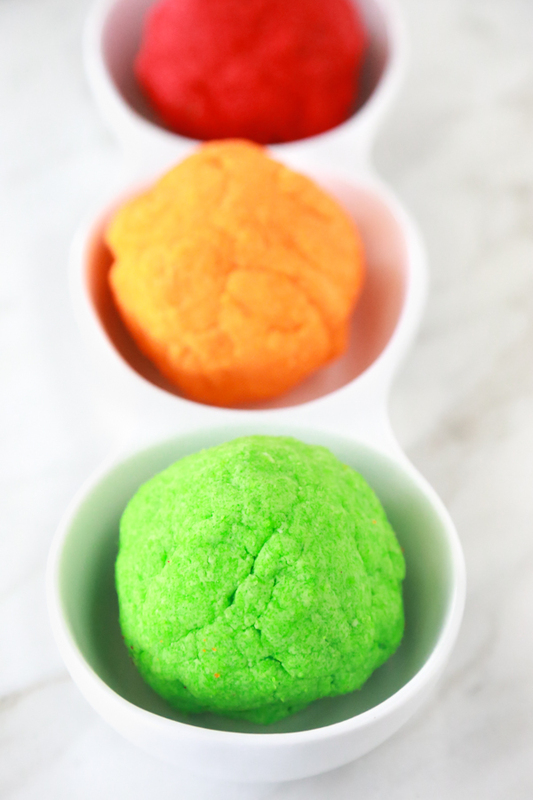 Since all the ingredients are food safe, it’s an easy and non-toxic play dough recipe perfect for children. 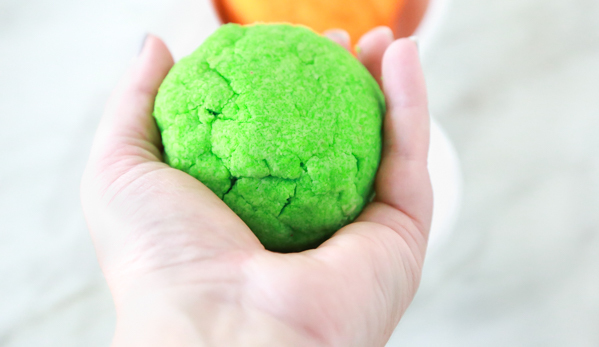 And because I know kids usually don’t like the clean up part, this Jello play dough is easy to clean up and washes off easily with just soap and water. Tip: You can use regular Jello Mix but I’ve found that the sugar-free version is easier because it’s less sticky. But if you only have the regular at home, go ahead and use that one. Note: Make sure everyone washes their hands before making Jello play dough. This way you can store it and play with it again another day. 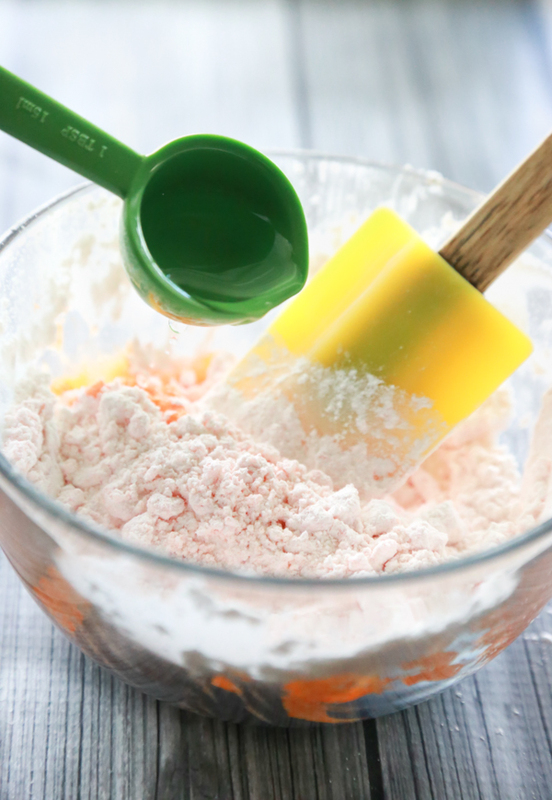 In a medium-sized bowl, pour in corn starch and Jello powder and mix together with a fork or whisk. Add in small amounts of water in increments, stirring in between each addition. 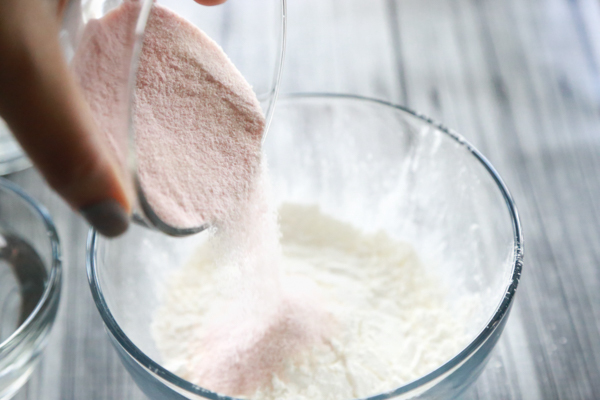 I add between 2 – 3 tablespoons the first time, and less each time after. 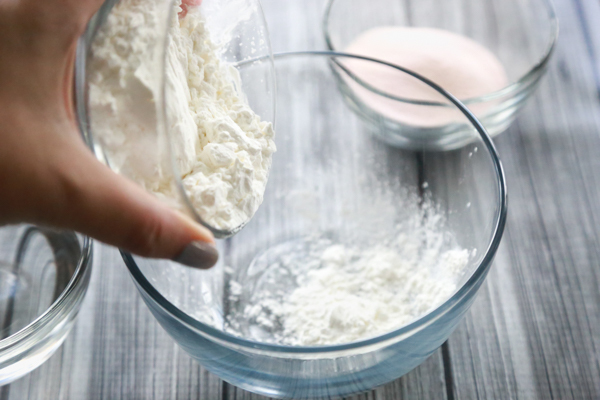 Stir in the water into the dry ingredients until a thick paste begins to form. Continue adding in small amounts of water until the Jello playdough stops sticking onto the sides and bottom of the bowl. 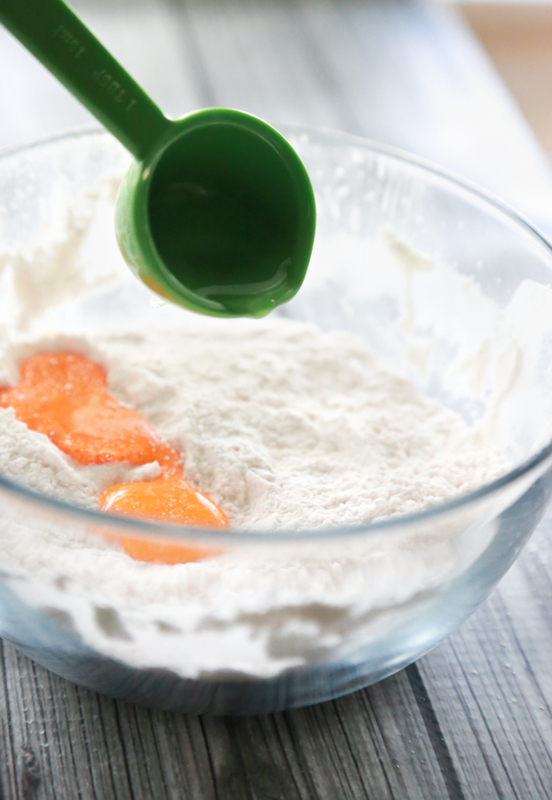 Once a play dough has formed, remove from the bowl and begin to knead with your hands. At this point you’ll be able to tell if you need more water or not. It should feel like a dough and not crumble in your hands. If it does crumble just add in a little more water. Note: Making Jello Play Dough may stain your hands. Just make sure you wash with soap and water often. It’s amazing what common kitchen ingredients can make. Who would have ever thought that you could make play dough with Jello? Not only is it a safer alternative, it smells soooo much better. I highly recommend that you just get in the kitchen and start experimenting with your children. There will be lots of failures (at least there was for us) but there will also be lots of successes. But you never know until you get in there and start experimenting. Through simple experimentation we’ve been able to make several play dough recipes. 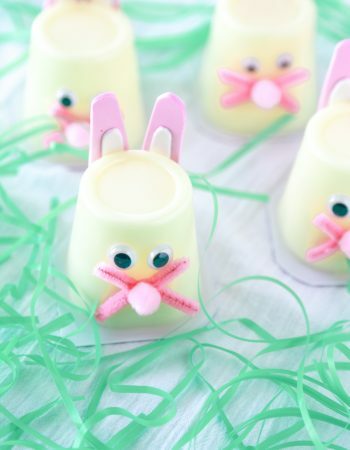 Try this Pudding Play Dough or Marshmallow Play Dough, too! They’re all really fun to make, all edible, and all smell so much better than store-bough play doughs. 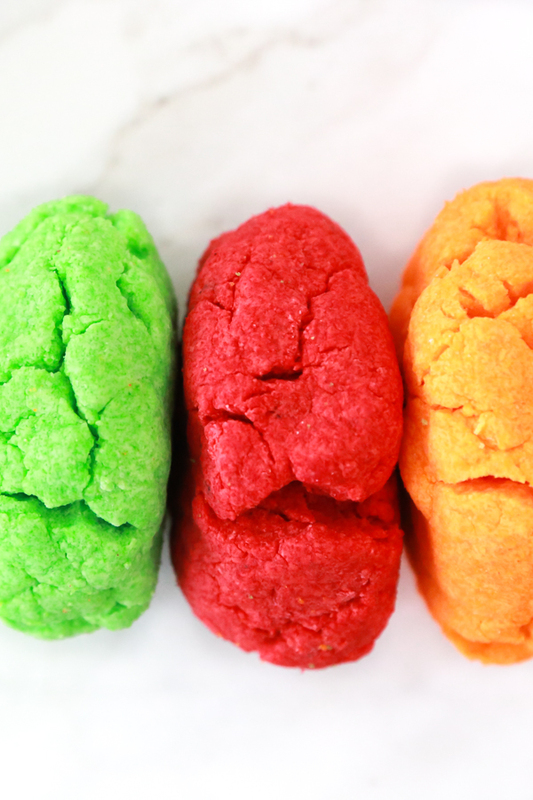 Since I know you followed all the directions above and washed hands before making this edible play dough recipe, you can store it in a sealed, airtight container. 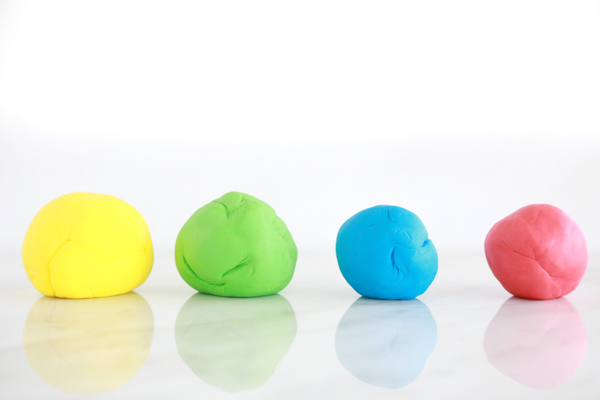 Since the play dough is made with food ingredients, I do recommend storing it in the refrigerator in between uses. Homemade Jello Play Dough will not last as long as regular play dough. Check it for mold each time before playing. When you see mold it’s time to throw it out and make a new batch. If the play dough seems a little dry, simple rehydrate with a little bit of water until it reaches a play dough consistency again. Note: I do not recommend tasting when playing with edible play dough for a second time. While this is technically an edible play dough recipe, I don’t recommend eating too much of it. I think a better term would be taste-safe. Since it smells so good kids are going to be tempted to put some in their mouths – and that’s totally okay. But lets not make a snack out of it, mkay? 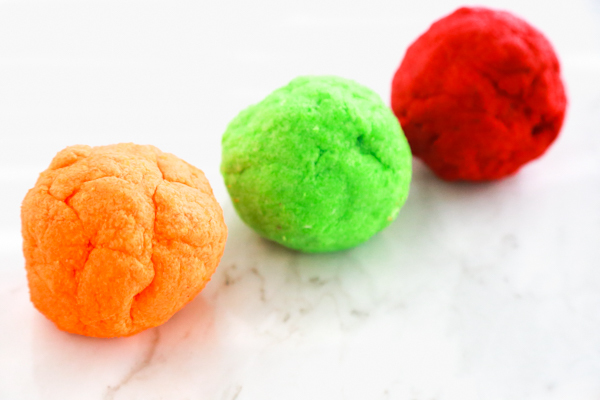 Don’t forget to pin this super fun and awesome smelling play dough recipe to one of your favorite Pinterest boards so that you don’t lose it.